Unit converter pro is a handy utility for students, teachers, and practitioners in engineering, physics, sciences, and technical subjects. It can quickly convert more than 1500 different units in 78 categories. It contains the most important conversion factors for length, area, volume, mass, force, pressure, density, energy, power, temperature, dynamic viscosity, kinematic viscosity, and time units. But it provides many high-specialized units and categories, too. Unit converter pro offers fully customizable databases. You can add, remove, modify, or hide units, and categories. It allows you to create, customize, and print out conversion tables of every category. Angular, viscosity Dynamic, viscosity Kinematic, volume Dry, and volume Lumber. Electrical: capacitance, charge, conductance, conductivity, current, electric field, inductance, linear current density, linear charge density, magnetic flux, magnetic flux density, magnetomotive force, resistance, resistivity, surface current density, surface charge density, and volume charge density. 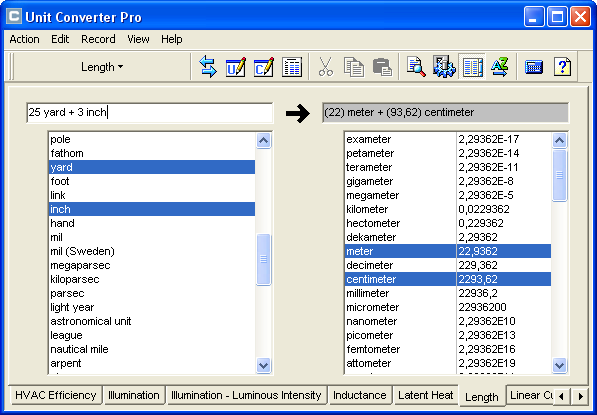 Unit Converter Pro is an utility that works under windows xp, windows vista and windows 7. It supports both 32-bit & 64-bit windows editions, therefore it could run faster on 64-bit computers. Estimated download time for Unit Converter Pro on a common adsl connection is less than a minute. Version 3.1 was released three thousand six hundred forty two days ago by Elkens Software. Click the green download button to download it now.